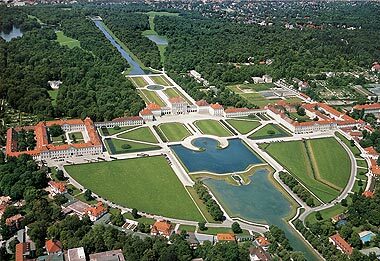 Nymphenburg Palace is an enormous palace complex just roughly 15 minutes by public transportation from the city centre of Munich, Germany and should not be missed based on the pictures. The original plan was just the center complex and construction started in 1664 and it was completed on 1679 based on plans by Italian architect Agostino Barelli. 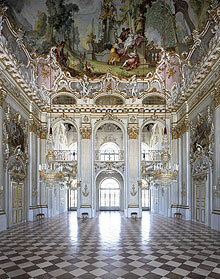 This was built for Max Emanuel by his parents Ferdinand Maria and Henriette Adelaide. What you see today was not fully completed until the 1800s. The adjacent structures to the north and south of the main complex was built later by Max Emanuel. Around 1715, the overall plans for what you see today was designed by Joseph Effner and Dominique Girard and it took until the 1800s to complete which involved redesigns of halls, rooms, the gardens and is it what we see now. 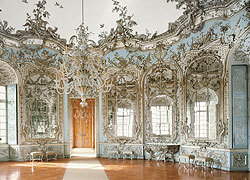 Nymphenburg is an entire complex and the admission tickets are priced accordingly (you can purchase tickets as a package which includes all sites or individually which include the Nymphenburg palace, Marstallmuseum, the Museum of Nymphenburg Porcelain, Amalienburg, Badenburg, Pagodenburg, and Magdalenenklause). 11.50 euros for all sites or reduce amounts per site. Currently, everything is open from April to mid-October (9:00 am - 6:00 pm) with closures from mid-October to March. For anyone with a smart phone, there is an app for this in the Google Play Store and the iTunes App Store. It includes tours, information on certain points of interest and is GPS-based but does not require data. Today, this palace complex is managed by the Palace Department (can't say I've ever heard of this department in Canada before) which maintains 45 palaces, castles and residences, 32 historic gardens and 21 lakes. Here are some neat stats about the place. The section within the walls covers around 180 hectares, the entire complex is around 229 hectares of which 158 hectares are for trees, 32 hectares for meadows and lawns, 20 hectares for water and 19 hectares for paths and squares.